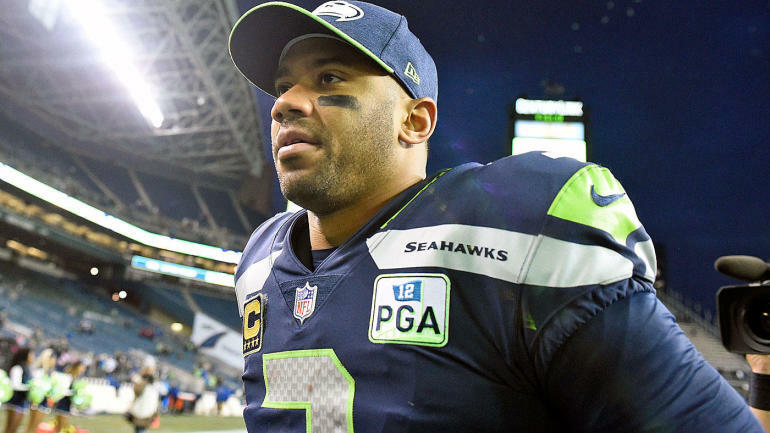 There is a substantial amount of speculation swirling around Seahawks quarterback Russell Wilson, with the former Super Bowl winner heading into the final year of his contract. Not enough people are talking about this — 75 percent of quarterbacks going into the final year of their deal with no serious buzz about a new contract would generate fanbase and media meltdowns. Everyone’s just sort of bobbing along when it comes to Russell. Fortunately we’ve got Jimmy Fallon on the case! The “Tonight Show” host had Wilson on this week and spent most of the interview asking Wilson about playing for the Giants and the rumors surrounding the Giants trading for him. Russell demurred, as you would expect, although he didn’t totally close the door. The former SNL star also asked Wilson about getting historically paid on his next deal. Asked by Fallon about being “the highest paid quarterback in the history of the league,” Russell certainly did not not shoot it down. Aaron Rodgers already broke the bank and set the mark. Wilson would need to top Rodgers in order do to that. There’s been a hesitancy around the NFL to actually put other quarterbacks above Rodgers; he’s gotten the Megatron treatment in terms of being the top contract with other players bumping up near his total valuation but never crossing it. Wilson could be a different story though. He’s in a unique contract situation that could very well end up with him playing on the franchise tag as soon as 2020, unless the two sides can work out a deal. Certainly no one believes the Seahawks are just going to let him walk into free agency after this season — if he did, Wilson would make north of $40 million per year and shatter Rodgers’ numbers. The Seahawks quarterback continued discussing the matter by pointing out that his background drives him to be the best in everything, and becoming the highest-paid player in NFL history certainly qualifies in that regard. “It’s not going to make me feel bad,” Wilson said. “I think being a kid, an African American kid, 5’11”, coming from Richmond, Virginia, went to a private school, everybody said I wouldn’t make it playing Division I-A, being able to do that, going to NC State, going to Wisconsin, getting to where I am now, just finishing Year 7, going to Year 8 and I believe I have 10-15 more years left. The last contract Wilson signed back in the summer of 2015 was a monster deal for a young quarterback who was taken in the third round and playing on a very small rookie contract. But it was also “just” a four-year deal worth less than $90 million. Wilson has wildly outproduced both his rookie contract and that second contract. The next deal he signs won’t be a discount. The Seahawks have likely been made aware of that — if not, they found out by watching late-night television! — and as such are probably making plans around a future budget that outlays serious cash for Wilson. Or one that doesn’t, depending on their valuation of the quarterback. And if they don’t want to pay him more than any player in NFL history, it’s possible we’re headed towards a situation where Wilson plays two seasons on the franchise tag and then REALLY gives the Seahawks an interesting and expensive decision to make on his future.